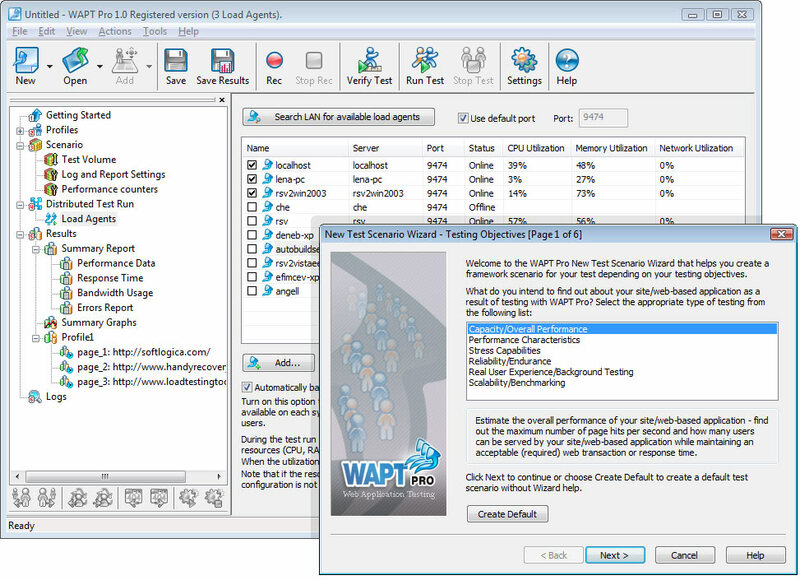 WAPT Pro is a professional version of the popular load, stress and performance testing tool for websites and web-based applications. It preserves all the benefits of the regular version, including its ease of use, ability to create comprehensive tests in a matter of minutes, flexible specification of virtual user behaviour, descriptive graph and reports for test results. At the same time the product includes several features required for testing of high performance servers, web applications that transfer large amounts of multimedia data, and applications severely depending on the database productivity. The product can use several different computers to create required test volume. Each system participating in the test runs a special service called WAPT Load Agent. They all are managed from a workstation running WAPT Pro Workplace component. It provides test engineers with a convenient user interface to perform all tasks from designing test scenario to analyzing the results in the same integrated environment. During the test execution it automatically balances the volume between load agents taking in account available resources of each system. Such distributed scalable architecture is fully transparent for the user. If higher volume is required for the test, the environment can be extended with new systems running load agents without changing the test specification. The testing process can be launched and managed remotely even over the Internet. In addition to capability verification, WAPT Pro can measure various parameters of the web server performance. This way you can see how your web application responds to the increasing load in terms of CPU, RAM or network usage. You can also collect various database performance data for MS SQL, Oracle, or any other database that can be accessed through ODBC. This data is included in the test results along with other parameters. Recent Changes: Recording tests with Firefox, Chrome, or any other external browser; Ability to export full test execution data to an external base; Full recording and replaying of request headers. Additional Requirements: 1 GHz or higher; 512 MB of RAM; 100 MB of free disc space; MS IE 6.0 or above. Site Downloader can download entire website and copy website. Submit your webpage to thousands of search engines and directories.